This is a rollicking space adventure, not my usual kind of read but entertaining nevertheless. It’s full of likable characters and strong female leads. Coming from a science background, I really enjoyed the scientific aspects of the story. While not a usual read for me: the story was fast-paced, layered and loaded with moments that mixed idealized intentions of behavior with the realities: squabbles, sniping, friendships and dangers all test the cast of characters as they seek to find ways to achieve Keva’s mission while not losing the communication, trust and opening the world for readers to travel along. Scientific aspects play a large part in the story, but never overwhelms the characters. Strong female depictions, plenty of growth and development of relationships, friendships and personal revelations, as well as a touch of romantic interest. 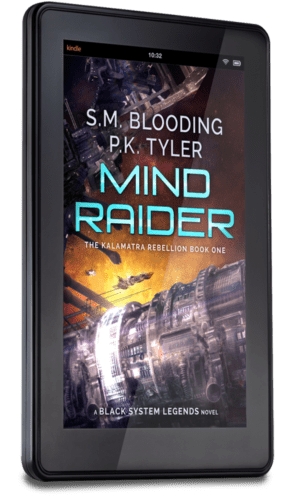 Mind Raider is a space opera involving engineered humans, smugglers, and sentient AIs. There’s plenty of action and intrigue here, but what I loved most was the characters, human and otherwise! I am a huge fan of stories that allow me to watch the characters learn and grow, and we get to watch several very satisfying character arcs develop here.